Creating watermarks in LibreOffice is not hard and they can help you enhance your documents significantly, allowing you to include your companies logo or the status of your documents right into the text. 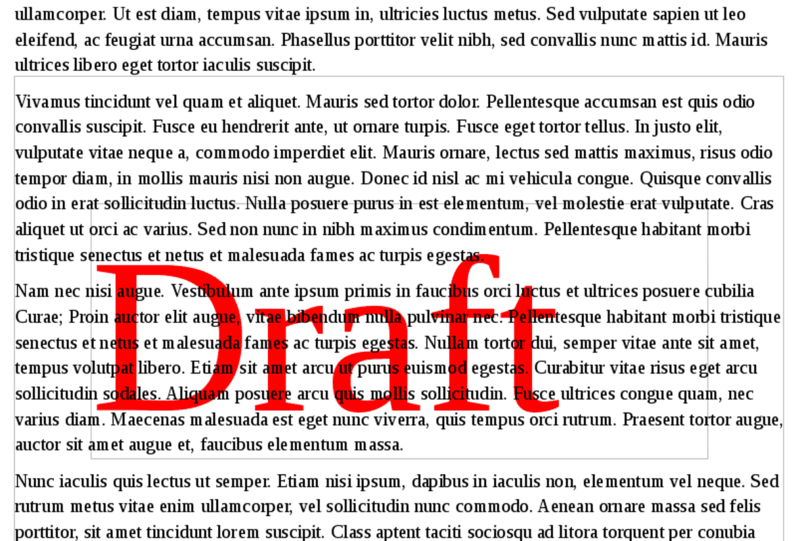 The text and objects in the document appear on top of the watermark. The Watermark frame style positions a graphic frame for use as a watermark. In some cases, you may want to open the image for the watermark in a graphics editor like GIMP or Krita, and make it semi-transparent. Experiment to see if this step is needed to make the text more readable. Add the image to the page and position it. If you are designing a page style, make the image recur each time the style is used by anchoring it in the header or footer. Select the frame of the image, which is added automatically with the image. 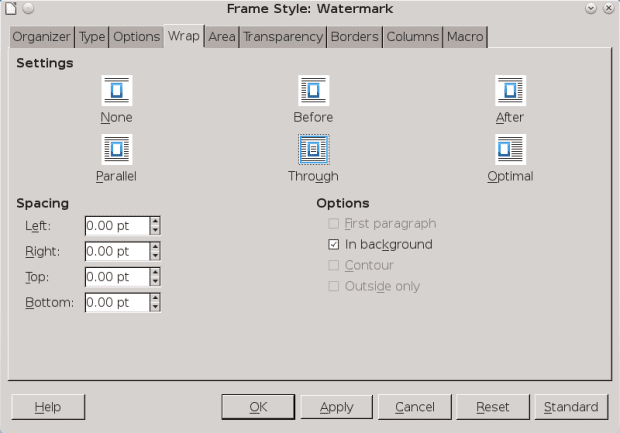 Then press F11 to open the Styles and Formatting window and select Frame styles > Watermark. 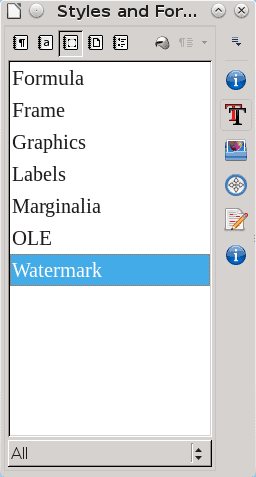 Watermark frame is one of the pre-defined frame styles in LibreOffice. Right-click on Watermark, and in the style dialog window select Wrap > Settings > Through and Options > In Background. You may want to do other formatting while you are in the dialog window, including adjusting the transparency. 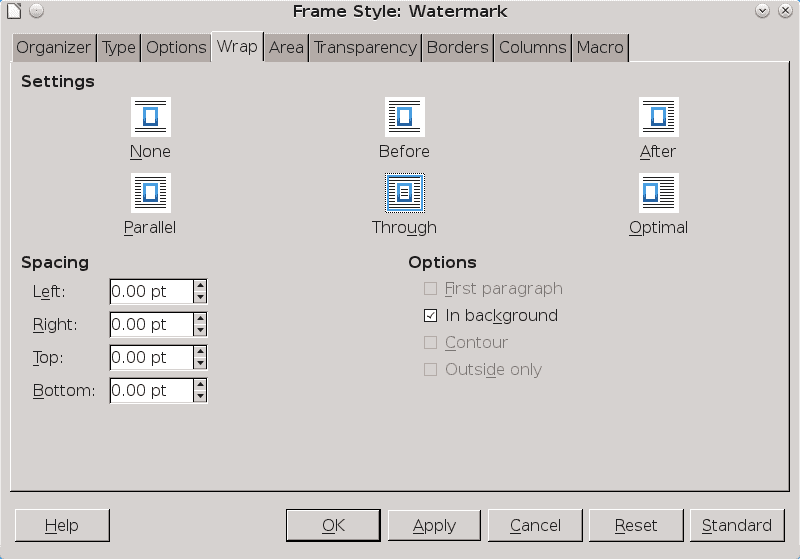 Use the Watermark frame style dialog to format the frame for the watermark. 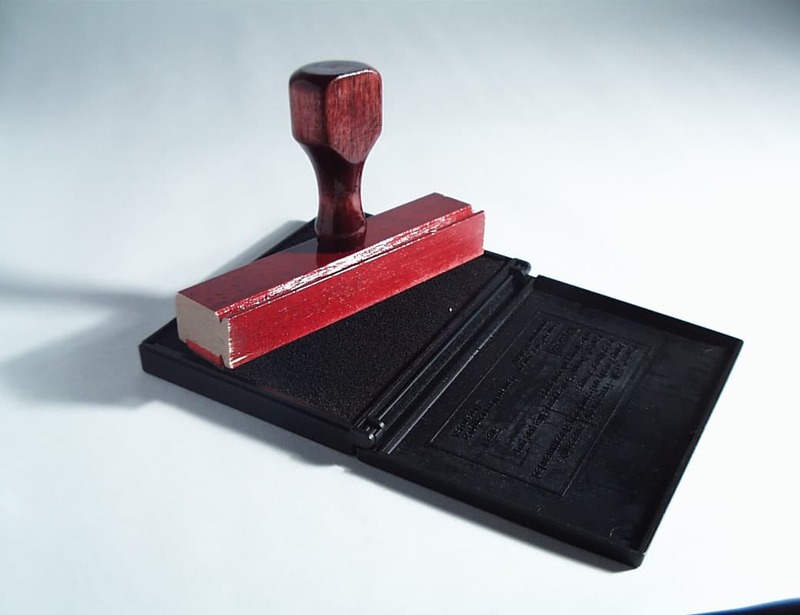 Repeat these steps for every page style that has a watermark. You may want to consider pairs of page styles — for example, one ordinary First Page style and another style called First Page – Draft that differ only in that the latter has a watermark. A page with a Draft watermark. An alternate way to add a watermark is to add a basic frame style with no wrap to a page of text and select from the right-click menu Arrange > Send to Back.You could also create a partly transparent graphic with the dimensions of the space between the page margins, then add it as a background to a page style. Because of the text on top of them, watermarks can be extremely difficult to select and edit. For this reason, try to avoid inserting a watermark that you will need to edit later. If you do need to edit a watermark, select it and click Format > Arrange > Bring to Front. If you are unable to select the watermark in the editing window, press F5 to open the Navigator and select the watermarked image from the list of images. “Repeat these steps for every page style that has a watermark?” So if you have a 300 page manual that needs to have a DRAFT watermark on every page, your recommendation is to manually apply the watermark to every single freaking page, one after the other, using this method? I don’t think that’s going to work well. Ah, nevermind, I’m pretty sure I misunderstood what you were writing the first time around.